Hart's-tongue in ”The Linnaeus-garden”. 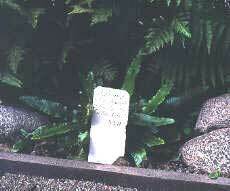 It was referred to class 24 as all other ferns. ”The flower is the joy of the plant” Linnaeus called out. In the flower the wedding between stamens and pistils is celebrated. But there were also plants that kept their wedding ceremony secret to the rest of the world. Flowering plants and conifers constituted the first 23 classes in the sexual system. The 24th and last Linnaeus called Cryptogamia, which means ”secret wedding”. There he lumped together the plants lacking flowers and seeds, among others ferns, mosses, algae, fungi and lichens. Those groups are still called cryptogams sometimes, but this name is the only thing reminding of Linnaeus’ 24th class. New pieces of evidence have meant considerable changes to the systematic biology. Fungi and lichens are now referred to a realm of their own, Fungi. The algae have been shown to consist of several very different groups belonging to a new realm, the Protista. Ferns and mosses are still considered to belong to the plants, Plantae, together with flowering plants and conifers. When comparing the sexual system of Linnaeus with a modern classification system, large differences are found. The group of organisms treated in the sexual system is today divided into 25 groups, divisions. Of these the flowering plants and conifers are divided into 5 divisions while the cryptogams are divided into 20 very heterogeneous divisions. In other words, there was greater variation within the 24th class of Linnaeus’ system than he could ever imagine.